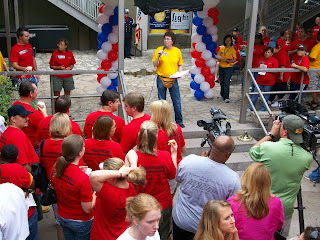 What a fantastic time I had at Freedom Day! All except the part where I had to be at this event at 7:00 am. (I got there at 7:30 - had to make a Starbucks stop!) 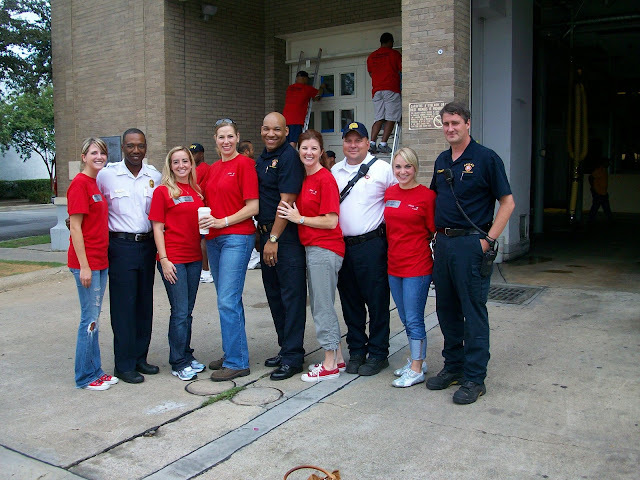 Freedom Day is a day of community service done in honor and remembrance of September 11, 2001. 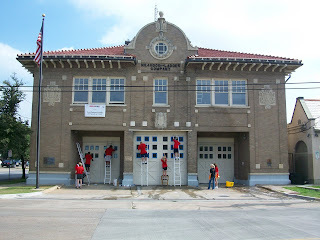 This years volunteers were working to help refurbish 6 Dallas-area Fire Stations. The day started out with a pep rally of sorts. Pam, EFNT Director, gave a heartfelt speech about why we should remember what happened on 9/11/01 that had many of us in tears. 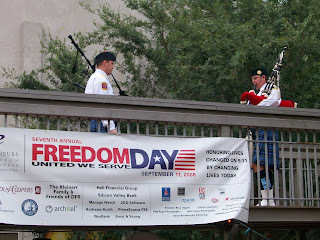 Then the Dallas Fire & Rescue Pipes and Drum core performed Amazing Grace on the bagpipes - that was cool and screechy. Then everyone deployed to the 6 different stations to work for the day: painting, landscaping, installing ceiling fans, putting together shelving units, cleaning, etc. I had Station #11 which is celebrating it's 100th anniversary next year. It's one of the oldest stations in the city and one of the very few that still has a fire pole that the men slide down to get to their trucks. 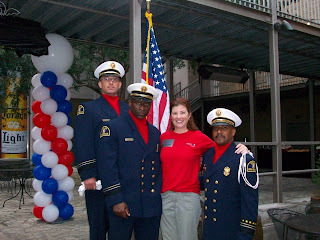 What struck me the most throughout the day was how polite, respectful, humble and appreciative these fire fighters were. Did I also mention that they were so handsome!!! There's just something about a man in uniform... It was such a pleasure to work with them today. The only thing I am mad about is that I totally chickened out of going down the fire pole. Not that anyone else did it either. I'm not sure if anyone else even thought to ask, but Capt. Carl told me I could, so I go upstairs and begin looking for where the pole is. I see a door and the sign says "Pole Hole" - hilarious. So, I open the door and step in and there's the pole. I grab the pole with my hands and look down - about 25 feet - and totally chicken out. It was humid and hot and I was nasty sweaty by the time I got home - which you all know is NOT my style. But I can't imagine a better way to commemorate the memory of 9/11.